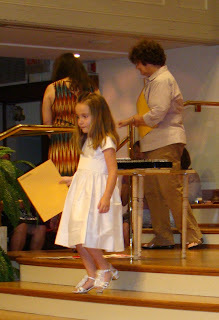 Today, Sadie graduated from Pre-K, ending her four years at First Baptist Weekday Preschool, just a few blocks up from where we live on Monument Avenue. The first day of pre-school, she was 18 months old and looked like this (top left). Today, she looked like this (bottom left). The first one she was leaving her sheltered life at home. And today, she left her sheltered life at this neighborhood school. 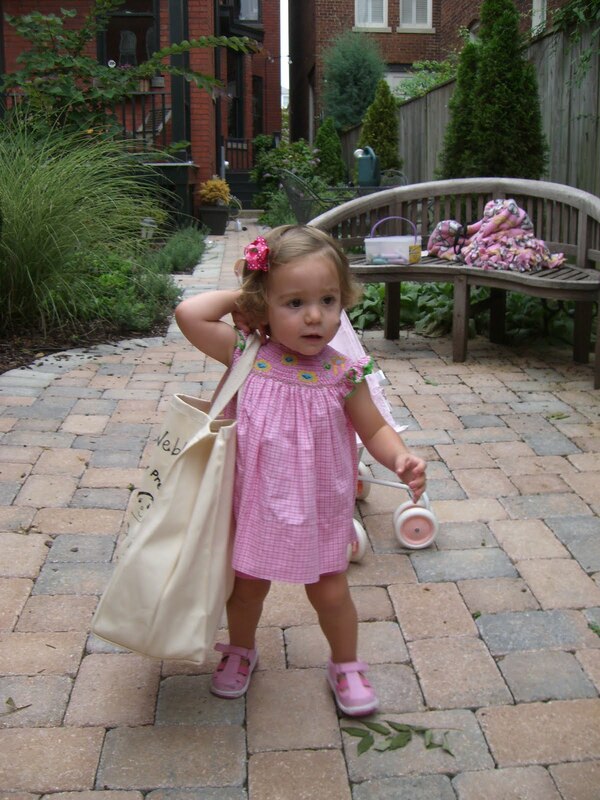 I remember fretting as I left her that first day of preschool. Like every mother in the hall, I was tearing up, knowing exactly which screaming child was indeed mine, calling for me. Wondering if she was too young for school, wondering if she needed me. She wasn't too young. She needed them, and all that the school provided, not more time with me. Today, she hugged her teachers and her friends, and proudly told her teachers that she was excited to go to Collegiate next year, and that one day she was going to be a doctor when she grew up. Some of the girls said that they were going to be mothers. I asked Sadie afterwards what she thought about being a mother one day "Yes, all of the girls will be mothers and all of the boys will be fathers. The question was what else I was going to be Mom." So, I have indeed taught her something in all of this. That it was ok to do more than one thing. Even though we haven't always been balanced. Even though I still often wonder what I am going to be when I grow up, I have taught my child that she can be anything too. Four years ago, and a thousand days between then and now, I find myself so proud of this little person. Just last week she begged to join the swim team, and was not at all daunted with her knowledge that she had not yet swam across the whole pool. And then last weekend, she learned to balance in and paddle a canoe and to ride her bike without training wheels. These days, she is not fearful of new challenges. She greets them with a wonderful mix of 10% confidence and 90% optimism. She isn't yet bratty or someone that compares herself to her peers. But she has learned how wonderful it feels to be proud of yourself. We saw it this summer when she ran the 1 mile race for the Monument Avenue 10k, and I felt like I bottled that image while I ran beside her and she rode her bike for a block without me holding on to the back of the seat. That priceless look of Look at me, Mom!! I didn't catch it on the camera... for once I was looking at her instead of through the lens when something like this happened. I don't regret that, for the unfiltered view was tremendous. Mark and I fret about the 25 minute commute to her new school come late August, and how we will manage without a nanny for the first time ever. How we will get out to Collegiate for class at 7:50 in the morning and how Sadie will manage to stay out there until 6 pm at night, all without dropping from exhaustion. But it is the plan. It is the reason I went part-time two years ago next month - to be more involved during these upcoming elementary school years. I am excited to be the one to get her from school (hopefully closer to 3 pm than our back-up for extended day/after care that allows for 6 pm). And so, this end... it is also a beginning. And for a few months, it will be a time of relaxation and fun. As she told me today "I can't wait to stay in my pajamas all day tomorrow. Well, until swim team time that is!" I stumbled upon your blog while looking for information about birthmarks. Our 2.5 month old has a birthmark that closely resembles your daughters at birth and now at this stage as well. We are trying to get a doctor's appointment but would like some advice on what questions to ask. You handled everything so wonderfully and as a freaked out new mom I could use all the encouragement possible!